If it’s on the internet it must be true! We all know, don’t we, that we have to be really discerning when it comes to choosing what to believe on the internet and what to take with a grain of salt. The same rule can be true if you try to find out about the saints of old. If you use your computer search engine to look up Mary Magdalene you will get some amazing information. I looked up the first 10 pages Google identified for me. I discovered that she is often assumed to be the woman who wept on Jesus feet or anointed his feet with perfume – but this was Mary the sister of Martha, or else an unnamed woman of ill-repute; which probably led to the next thing I discovered. I discovered that Mary was probably a prostitute, and that she became the patron saint of fallen women – so in the Middle Ages many “Magdalen Houses” were built and run by nuns to gather such women in. I discovered that there are five Gospels that are not in the Bible that tell stories about Mary. I discovered that Mary was cast out of Palestine on a boat without sail or oars and she ended up in Southern France. Relics of this are still present to this day. I discovered that Mary was actually the married to Jesus and some say there was even a child. I discovered that she had starring roles in 40 movies since the first in 1912. But none of this is based in fact so what can we say about Mary Magdalene with any certainty? Firstly, she is named more often in the Gospels than many of the Apostles – a dozen text references. Apart from the birth narratives, Mary the Mother of Jesus rates just eight Gospel references. 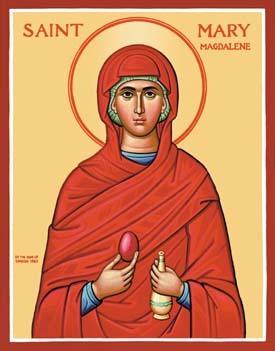 So it is reasonable to regard Mary Magdalene as very significant in the Early Christian community. Luke also mentions that Jesus healed her – the text says 7 demons, but since 7 is a symbolic number it is a bit difficult to know for sure what she was healed of. This is the only reference to her prior to the Crucifixion and Resurrection stories. Matthew, Mark and John name Mary among the witnesses of the Crucifixion. Matthew and Mark note Mary as one of two women who witnessed the interment of Jesus’ body in the tomb. Finally, all four Gospel writers name Mary among the women who gathered at the tomb early on the Sunday morning and discover that it is empty and who then passed on the news or the instructions of Jesus, depending on how the story is told, to the Apostles. Anything else that you think you might know about Mary is either the product of the accumulated tradition of the Church, or our tendency to merge the stories of the various Mary’s into one and say this is Mary Magdalene. So, what do we make of this Mary? Why is it that she occupies a very hallowed or noble place among the community of early saints? In the language of the Church she is called the Apostle of the Apostles. The word Apostle means a messenger or an emissary – one who represents the words of another. Just as the 12 Apostles were sent by Jesus in the Great Commission of Matthew 28, so Mary Magdalene was sent by Jesus with a specific message for his disciples. In the scheme of things this seems to be a very strange state of affairs. As Dee reminded me during the week, in those days the testimony of a woman held no weight in the courts. They were never taken seriously – I guess because women are so often hysterical! And we get a little bit of resistance to the witness from the men, don’t we – but maybe that was because the idea of Jesus’ resurrection was unbelievable rather than because it was some hysterical women who told them. I don’t suppose we will ever know, but it is clear from these references to Mary Magdalene, and her very significant place in the early Christian community, that she was acknowledged as someone special among the saints. I really hold an egalitarian view of life in the Kingdom of God, but many in the church have held out an hierarchical view of things, even down to having a hierarchy of saints. We have marked this difference by having different names for the kind of commemoration we have of a saint. In the Anglican Church we have Principal Feasts, Principal Holy Days, Festivals, Lesser Festivals and Commemorations. Just this year, Pope Francis has elevated the commemoration of Mary from a Memorial to a Feast – right up there with the Apostles, Peter, James, John and Paul. Again, what this says is that Mary is really, really important. We must not disregard her as an insignificant or bit player in the story. Given the place of this woman as the first witness to the resurrection, as the one to whom Jesus entrusted the task of telling his Disciples that he had been raised to life, I think it really is sad that women have had to struggle over the years to feel validly part of the Christian community. In the story of Mary Magdalene, in the story of Priscilla and Acquilla, in the stories of so many of the women in the early church we see women accepted as equals in the community of believers. I want to see a church in which this is more and more the case. We have come a long way in our lifetime in redressing the imbalance that saw all leadership in the hands of men – and the church is much healthier for it.